My copy of Liane Simmel’s book ‘Dance Medicine in Practice’ (newly translated into English) and published by Routledge has just arrived. I love the anticipation of opening a brand new book. When I heard that Liane’s book was now available in I immediately ordered it and at first glance, it certainly does not disappoint. This post is about my first impressions of this book as I have yet to read it. But flicking through the sections and pages it seems well thought out and offers a lot of useful information as one would expect from a medical doctor, osteopath and former professional dancer who specialises in dance medicine. The book has a number of features including essential anatomy exploring how all the parts of the body move and function and particularly under pressure. Load and overload is explored in relation to dance in some detail – something that I am certainly interested in enhancing of. Simple and effective exercises are given for mobilising, strengthening and relaxing joints and muscles. There are checklists of dos and don’ts for technique and simple methods for self-analysis on recognising the muscles required for the dancing body. tips on how to avoid and correct the pitfalls of poor practice in dance and everyday life. A quick look at some of the exercises presented and I am already planing which ones I can include in my own personal regime. Page 64 under Pitfalls in Dance mentions something that dancers often do – cheat. Yes cheating to achieve turnout is quite common. I can certainly remember doing this when I was training to combat my lack of natural turnout. This section explores the effects on the pelvis of forced turnout, tucking the pelvis under and other ways that dancers use or are encouraged to use to achieve turnout. The advice is practical and makes good sense as the section progresses to self-analysis and assessment of the pelvic position as well as providing good tips for prevention of pain and discomfort. I keep stopping to read bits when I am flicking through this book – a sign that it is full of interesting things that I want to read and find out about. The section about the hip already looks fascinating and again I am drawn to the load and overload aspect in relation to dance. Forced turnout is considered here and the effect on the hip joint. I note one useful tip (p 88) that I will share here. This tip reinforces something that I am keen to promote with dancers – avoiding over-tightening the glutes so it is easier to use the deep external rotator muscles of the hip. Also, as we know, it is important to remind ourselves that turnout should only ever be turned out as far as the muscles can hold the external rotation. So all the forcing the feet against the floor to try to give the impression that the turnout is greater that it is a big no-no. Useful exercises are provided for mobilising and strengthening the muscles in this area. Forced turnout is again addressed with the knee chapter. I can see that the importance of the knee to the dancer is clearly addressed here. Dancers don’t necessary look after their knees and warm them up as well as they should. This chapter gives excellent advice about this and I am already reading bits of the load and overload section as I glance through the book. Further chapters include an in-depth look at the foot and how it relates to the rest of the body. Chapter 7 explores the shoulders and arms, Chapter 8 is about ‘Dancing with Health and Soul. There is a chapter on nutrition, another on dance and growth and one about dealing with injuries. The final chapter addresses how to plan training. Here the science of training is drawn on with the aim to help the dancer perform at his/her best with good health for as long as possible. Five aspects of fitness are explored here: flexibility, coordination; speed; strength and endurance as well as warming up and cooling down, timing and recovery. So plenty to read from cover to cover or to dip into particular sections. All of it looks interesting and I know I will enjoy it. My copy is already looking as if it has a bit of wear and I expect it will look a bit more thumbed very soon. I am happy with my new dance medicine book. If you buy a copy for yourself (and I hope you do) then please share your thoughts about it in the comments facility. 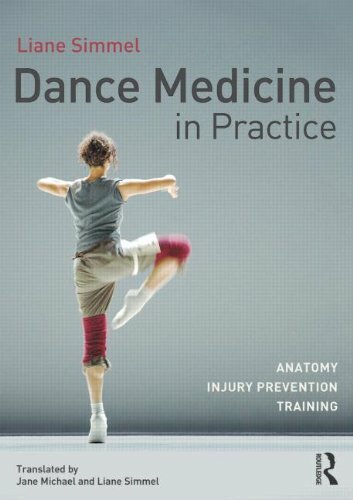 This entry was posted in Books, CPD, Dancer health & wellbeing, Injury prevention, Reflective practice, Relaxation skills, Safe Dance Practice for Dance Teachers, Tips for dancers and tagged Anatomy for dance, dance medicine, Safe dance practice, Safe Dance Practice for Dance Teachers by Sho. Bookmark the permalink.